Last weekend, I harvested carrots. I always have problems with vanishing seedlings when I try seeding directly in my raised beds, so last fall I thought I’d be smart and sow a ton of carrot seeds and then pull the extra seedlings out when I was sure they were big enough to survive any attacks from small animals or insects. But then it got cold and I got busy and I never thinned out the seedlings. So when I was preparing my raised beds for spring last weekend, I pulled out about 50 bitty carrots. 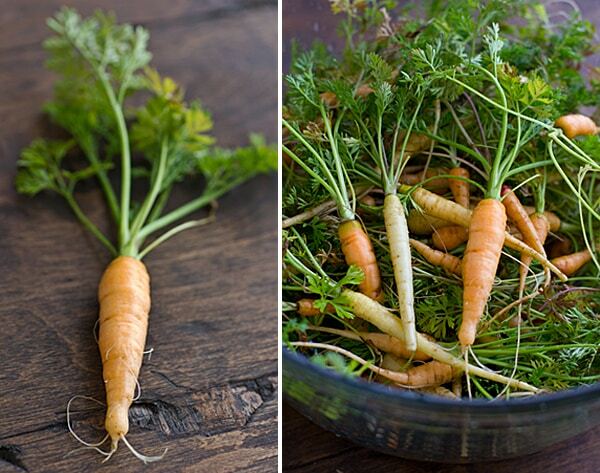 My carrots may have been too small to use for much, but after I harvested them, I started coming up with ideas for carrot recipes and I was just itching to try them out. So I bought some normal sized carrots and got to work. 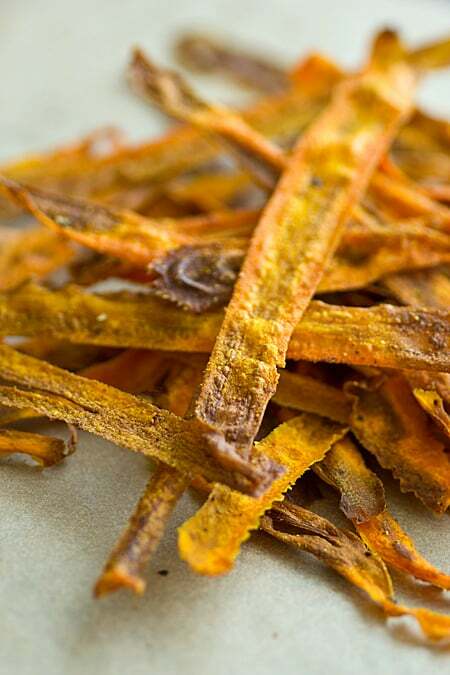 Dara from Generation Y Foodie mentioned carrot chips to me a few weeks ago and making a curried version was at the top of my list. I’ve never had carrot chips before, curried or otherwise, but I’m completely enamored with these Curried Baked Carrot Chips now. Carrots aren’t exactly my favorite vegetable, so I figured I’d eat a few of these and give the rest to Chris. But no! These are really, really good–so good that I didn’t want to share. (And maybe I shouldn’t have after he so cruelly mocked the wee carrots I grew!) If you’re not a fan of curry, you can make these with salt and pepper or any other seasoning you like. All you need is a large carrot, a vegetable peeler, a little bit of olive oil, and in a few minutes, you have delicate, crispy oven-baked carrot chips. 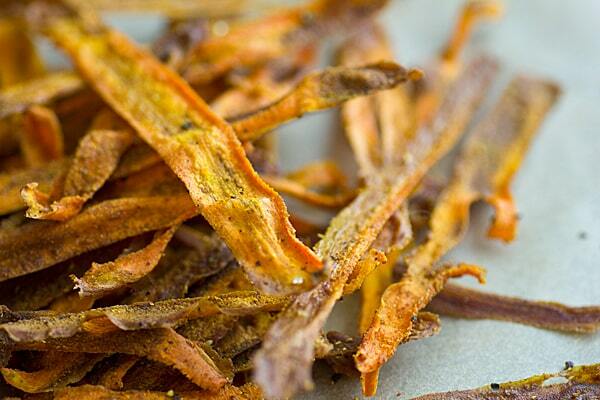 These spicy, crispy carrot chips make a healthy single-serving snack. If you double the recipe, use two baking sheets and alternate them in the oven halfway through baking time. Adapted from Chow’s Carrot Chips. Preheat oven to 350 degrees. Spray a large rimmed baking sheet with olive oil mister or cooking spray. 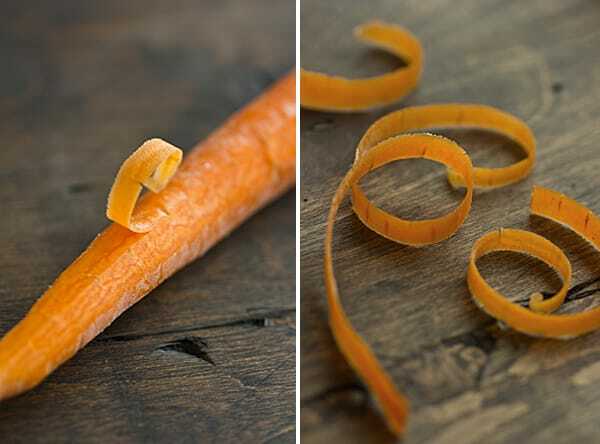 Holding onto the small end of the carrot, use a Y-shaped peeler to peel paper thin carrot strips. Try your best to make them uniform in thickness. 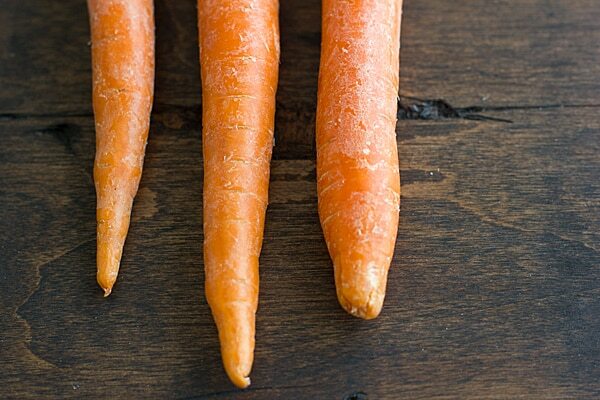 You’ll have some carrot leftover when it gets too thin to peel. Either eat it or throw it in your vegetable scrap bag to make broth with later. Place carrot strips in large bowl. Toss with olive oil, curry powder, salt and pepper. Transfer strips to baking sheet in a single layer; the edges can be touching, as they’ll shrink when they bake, but don’t overlap them. Bake for 10-12 minutes or until chips are just starting to brown. Place baking sheet on a wire rack and cool until chips are crisp, about 3 minutes. Carefully remove chips from baking sheet (they are thin and will break easily! ); eat right away or store in airtight container for up to 5 days. You are such an inspiration! I have never tried to grow carrots, but may try this year. Definitely enamored with those carrot chips now as well!!! Might give them a go tomorrow already! Mine were delicious! Even my husband who doesn’t like carrots (I wish I’d known that before I bought a bag!) liked them. Mine came out super skinny, though, and some of them didn’t get entirely crisp. I’m so glad you enjoyed them–thank you for your comment! I just had to make these. They are super yummy! I ate the whole batch in a few minutes. Thanks for the recipe! Makinkg these now! Thanks for the info! I live by Southpoint Mall! Hi neighbor!!! They were very good! I over spiced them, so next time I will watch that! Have you tried beet chips? I may give that a try! I haven’t tried beet chips, but I’ve heard they’re delicious! what sweet curry powder did you use? Can it be made from scratch? I’m the editor of the online journal The Peaceable Table. 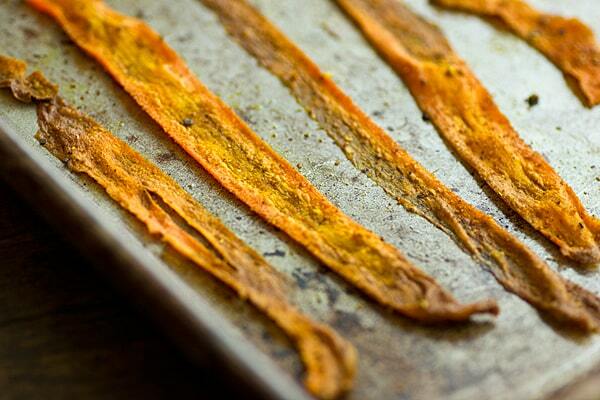 I request permission to reproduce your curry carrot chip recipe in the forthcoming (May) issue. We do license our recipes and photos to be republished; please email me at [email protected] to discuss. ‘t’ but they turned out soggy. If they turned out soggy, they either needed to bake a little longer or they might have been cut too thick.